We know you're busy. Why not save a trip to the bank? Save time and gas by easily depositing your checks wherever you may be. Now you can make a quick and secure deposit of your checks with our Mobile Banking App. You can even check you balance, find ATMs, pay bills and transfer funds. 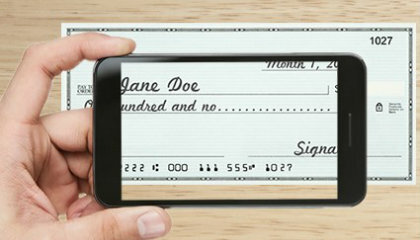 With Frontier Banks Mobile Banking App, you can deposit checks via you Mobile phone anytime, anywhere! Hold original check for 14 days and make sure the check has posted to your account, then write VOID on the front of your check and destroy the check. If the deposit has not posted or you have any difficulties, please contact Frontier Bank as soon as possible.